I would even pee hop on you every once in a while. Until that fateful November morn. When the trees were swaying. The leaves were skittering. 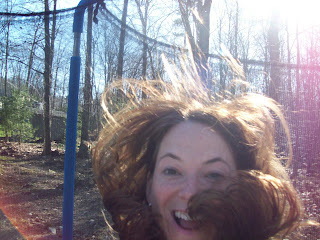 And the wind was whipping ferociously and violently. A loud THUMP WHUMP CRASH was heard from our sunroom. We all sprang to look. And there into the trees you had blown...with what appeared to be a major concussion and 2 broken legs. So RIP, family trampoline. You will be gone (in the spring) but not forgotten (because we will probably just replace you with a new one). 2 new book giveaways over at my review blog! Another New England weather tragedy...my sympathies go out to you and your family on the loss of your trampoline...may it rest in peace until spring. 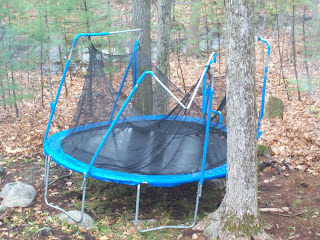 The one thing I was always mad at my parents about growing up was our lack of a trampoline. Thing of all the calories you could burn jumping on it! Also, I wanted a pool but that was in a whole nother ballpark. I know my boys would love one of those- but Hubs always says that maybe we'll buy one...for our neighbors. All of the fun, none of the liability. 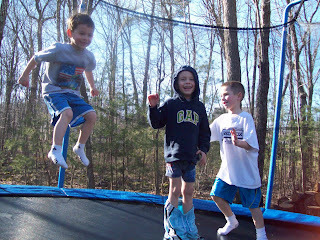 Trampolines are awesome things for exhausting children. Sorry about your loss. Ever since the rednecks on AFV started breaking bones on them, my husband has vetoed them. I would kill to let my kids bounce off energy in one. this casualty must have really shaken up your family. but now what are you going to do to exhaust your children? make them run around the block a few times? the energy needs to go SOMEWHERE. i looooove your pic jumping on the jumpy jump! AWESOME! Cracks me up all the safety net around them these days! I hope you get a new one soon. I can't imagine childhood without one. I love how your son is so nonchalant about his pants around his ankles. heh. Those trampolines always look like fun, but I'd be terrified of injuries.